Staz eats sushi for the first time! Blood Lad. And Staz and Wolf’s family problems revealed with Episode 4. Return to the Human World! Fuyumi’s dad cares about her skipping classes. Staz decides to visit the human world and in doing so find a way to also resurrect Fuyumi back to her old self. Staz continues to be his old melodramatic self but, hey, it works for him! That is what makes Blood Lad so full of laughs. Fuyumi though is having a hard time adjusting back home. It doesn’t help that thanks to ,Staz, Fuyumi’s actual absence hasn’t been felt by anyone but to her it is real. This causes quite a few moments of doubt on Fuyumi’s part. Hydra Belle forces Staz to do an errand for him which results in a strange situation for him. Enter Wolf. One cool guy. Last time on Blood Lad we were introduced to Hydra Belle who’s a slightly sadistic-ish girl. she had informed them last episode that the Book of Human Resurrection was in the hand of a West territory demon. Thankfully, Staz happens to know this demon who is an old friend named Wolf. We have a spontaneous fight between the two which ends up making Wolf realize he too wants to protect Fuyumi. Episode 3 makes use of anime-manga old tropes like a funny nosebleed reaction from Wolf. 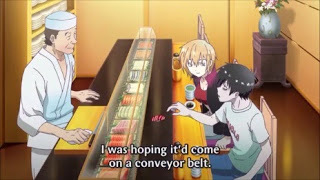 Along the way there were many weird moments but you should be prepared to expect this with Blood Lad and just any anime in general sometimes too. And so the search for a way to restore Fuyumi as a human continues. While Episode 3 brought Staz and Fuyumi closer to a cure to her being a ghost. Staz still has one problem. HE may have the Book of Human Resurrection but he doesn’t or anyone close to him the ability to translate it and read it. The only capable person to do so is the author himself which just so happens to be his older vampire brother. But the problem is Staz and Blood D. Bloods aren’t exactly on speaking terms these days. 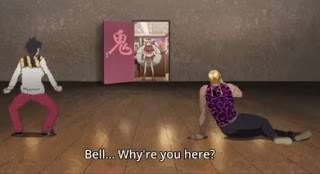 Staz actually ran away from the prestigious demon world from where he came from. He did so out of wanting to get away from his older brother since as a small vampire child his older brother always experimented on him. Since then Staz became aware his older brother held suspicious intentions for him. Yet, somehow Blood D. Bloods surely must have a reason for wanting to kill Staz, right? was being with the wrong person in the romantic side of things. Episode 4 actually highlights the romance present more so than previous episodes. Yet, Staz and Hydra Belle and Fuyumi and Wolf, not sure about these pairings! Honestly Staz and Fuyumi are the golden couple and that is how it should be. That is just my Blood Lad fan opinion though. At least this makes the situations interesting. 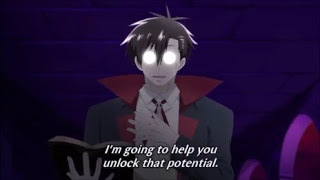 Blood Lad the anime series with its Episode 1-4’s appeal thus far continues to be some wonderful over-the-top comedy, a tad of romance, weird but fun character reactions, and occasional suspense-filled action and fight scenes. The animation is a perfect compliment and makes the characters interesting to look at. Really enjoying watching Blood Lad so far, so recommend it for the Summer 2013 Season anime. 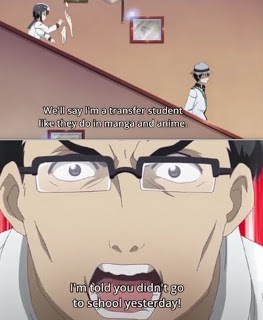 The Op is very cool in my opinion. Gets you in the mood to watch the next newest episode. The Ending Theme Song is pleasant enough. Much more subdued. Recommend the OP more.